Fearless Mountain: What was your religious experience as a child? Ajahn Amaro: My family was only nominally Church of England. My parents were not at all church-going people. But like many Brits, they thought that even if they didn’t go to church or have any religion of their own, the children ought to have something. In British schools, the only compulsory subject is religious study. We had a Church of England religious service at the beginning of each day. But I had a lot of questions about Christianity, particularly about the need to believe in doctrines. I was one of those children with 10,000 questions. A lot of what we were taught in religious studies classes really puzzled me. I couldn’t figure out what it really meant. FM: Had you even thought of becoming a monk, or did it come as a surprise to you? FM: What you most hate comes back to you! AA: It’s called karma. Hating something often creates a tighter bond than loving something. By the time I finished university, it was clear to me that spirituality was the only meaningful thing. I could have done post-grad stuff at the university, but I had made a vow to never take another exam as long as I lived. My godfather was a partner in de Beers Diamond Corporation and offered me a job there, but the business world was totally unappealing. Taking psychedelics had underscored my feeling that spirituality was the only important thing in the human world. I was in search of spiritual guidance. I wasn’t looking for a teacher or a community. I was looking for a system of practice or training, or way of being, that was true or real. After my twenty-first birthday party I set off on a one-way ticket to Asia. But rather than mingling with Asian culture and spirituality, I found myself hanging out with the same middle-class white crowd of dope-heads that I had been living with in England, only now we were in the tropics. I found myself in a quandary. I knew I needed to learn how to meditate. In the Buddha’s life, the fourth heavenly messenger was a wandering yogi. My version of this came in Java at a point when I was feeling extremely neurotic, stoned and grubby. Here I was on a perfect tropical beach, very quiet and beautiful, with absolutely nothing to complain about, and yet I was in a confused and messed-up state. As I walked along the beach at sunset, I saw a blond, bronzed “surfer dude” sitting in full lotus on a ledge in front of a cave.Approaching him, I thought, “It’s God!” I was half joking, yet a clear intuition arose: This is what you have to do. Four months into my travels I went to Northeast Thailand to escape the tourist scene. I found out you could stay in a monastery for free, and I heard of a monastery for Western monks.My first mental image was of a bunch of prune-faced ascetics with thick glasses and dour looks. To my surprise, I found that the abbot, Ajahn Pabhakaro (Joseph Kappel), was a regular and pleasant guy. The other monks were the same. A few days later Ajahn Pabhakaro took me to Wat Pah Pong to meet Ajahn Chah. He explained that I had been a student in London about a mile away from the Hampstead Vihara, where Ajahn Chah had visited only six months before. I had read spiritual books telling stories about the master and disciple meeting – the meeting of the eyes and the blinding flash of the heart. I was expecting Ajahn Chah to welcome me into the fold as a spiritually sensitive and mature being. Instead I got this absolutely expressionless face. “There are lots of pretty girls in Hampstead”, he remarked. I had wanted a loaded first exchange, but I didn’t want it to be loaded with that. I felt I was way beyond sexual obsession and quite the spiritual person. Even though this teaching wasn’t what I wanted, it was very powerful. I found myself wondering why he was noticing pretty women, and then I realized that a spiritual being could notice an attractive person and acknowledge it. Ajahn Chah seemed to be asking where I was on the sexual attraction question. Unless this dimension is understood and transcended, he knew I was not going to make it as a monk. FM: Have twenty-five years as a monk just flown by like they have for the rest of us, or is there a slowing of time living in the monastery? AA: The patterns of our days changes throughout the year.When there is a lot going on, days fly by in a finger snap. Yesterday, my alarm went at 3:45 A.M., and the next thing I knew it was 9 P.M. Things were scheduled all day long. But we take a couple of weeks of solitary retreat a few times a year. I usually fast and just stay up at my kuti. I really enjoy these times. Time stops. There is the cycle of day and night, but the time is completely your own – no schedule to meet, no personality to be. I don’t have to be Ajahn Amaro, which is a great relief. There is an oceanic presence of timelessness. The heart can be fully aware that this moment is infinite. Ajahn Chah was completely disrespectful of time. He wasn’t insensitive or casual, just unaffected by the clock. If there was a good Dhamma conversation going on at midnight, he would continue, and the next thing you would knew it was 3 A.M. He demonstrated a quality of timeless presence. His way of walking was one step at a time; there was never a “becoming” quality. Just watching him you were reminded of the timeless dimension of our nature. When I first started monastic practice, it was agony to find myself with open time to meditate, because the mind was so heavily conditioned to get on to the next thing. Over years of practice the addiction to becoming is vastly reduced. The spaciousness is delightful rather than a torment. FM: Has your practice changed over twenty-five years, or has a core practice remained helpful throughout the years? AA: Well, things do modulate over the years. In terms of actual techniques, two things I learned from Ajahn Sumedho have been immensely helpful. The first is the use of inquiry and reflection “dhammavicaya” where one uses questions and internal statements to clarify mental states, to let things go, to explore and transcend the conditioned states and experiences. For concentration, I find the meditation on the nada sound to be skillful. I have used that far more than the breath ever since 1981. It’s a helpful bridge between concentration and insight. You can use it in combination with the breath, in combination with reflection and investigation, or as a straight concentration object. It also helps to energize the system. One might not think of the vinaya (monastic rule) as a meditation practice, yet the kind of attention it brings to your actions and intentions pulls things into focus: Was that action wholesome or unwholesome? What was the effect of that? Can do without this? Giving attention to mind-states and motivations of liking or disliking, honesty, and having time for other people has a tremendous power. Ajahn Chah once said, вЂњIf all anyone did was keep the vinaya for their life as a monastic, then they would definitely realize stream-entry, even if they did no formal meditation practice. You develop a lot of powerful paramita in letting go of desires and aversions and fears.Vinaya is not just training in ethics but much more of a meditative tool. Arousing the intention to live in a noble way has a very potent effect. FM: Are there any further thoughts on your twentyfive years in monastic life? 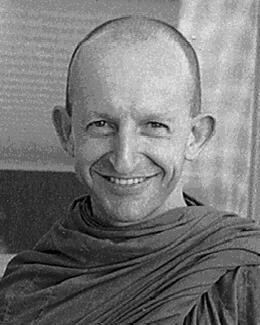 AA: When I first met Ajahn Chah, I was shaken by our interaction but also struck by how incredibly at home I felt in the monastery, even as a hippie anarchist with a conscious dislike of organized religion. I remember an incident that really brought home to me what a different outfit Ajahn Chah’s monastery was. One morning as an anagarika I woke up late because my clock had died. I have never been much of a morning person. I opened my eyes amazed by how brightly the moon was shining through the planks in my wall. Then I realized it wasn’t moonlight. I raced to the main hall and acted nonchalant, hoping no one had noticed I hadn’t been there for the morning sitting. Ajahn Chah had a foot wide grin on his face when he spoke to me. Ajahn Pabakaro translated: “Sleep is delicious.” Here I was, a miscreant novice, and the head master had zero recrimination. There was nothing even to forgive. It’s just this. It was the counterpart to “lots of pretty girls in Hampstead.” In both cases, I was at a loss for words, which is unusual for me. [Laughter] Something snapped inside: This is a different outfit. This is a system of authority, a type of institution I’d never experienced before. It gave me faith in what was beyond the institution; the spirit of it was extremely powerful. One reason I found myself quite comfortable in the institution of monastic life was that I hadn’t gone seeking for it. I had no idea that Buddhism was a wonderful thing. I was essentially in robes before I had an idea about it. It was the experience of being around people who followed these teachings that really impressed me. The fact it was called Theravada Buddhism “with all the rules and the uniform” was secondary to the actual presence of the Dhamma apparent in the people. Those who think that Buddhism or the teacher – or some sort of ism is the central thing either dry up or fall away. They know all the words and can play the tunes, but they never quite learn the song to quote the Incredible String Band. I find it a real blessing that the experience came first and the skin of the institution followed. As Ajahn Chah used to say, “So many people peel the banana and eat the skin, throwing away the sweet and nourishing fruit.” They consume the skin of the religion and then can’t figure out why it tastes bitter and gives them indigestion. Ajahn Chah was a totally faithful and extraordinarily strict monk, but he was completely unfettered by the conventions of the religious form that he followed. Seeing how this works is a flat-out miracle to me. It’s not that “It’s empty, therefore defy it,” or “It’s real, therefore be subjected to it.” The form is completely empty and completely meaningful, not 50-50. It’s the middle way, the mysterious way of taking the convention seriously and understanding its transparency at the same time.